Got fussy eaters? 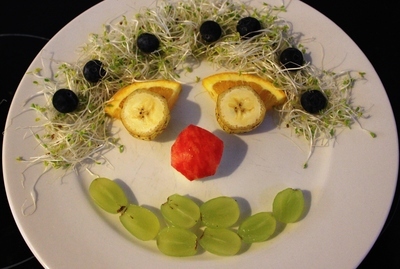 Trying to get the fruit and veg in and looking for some creative options? 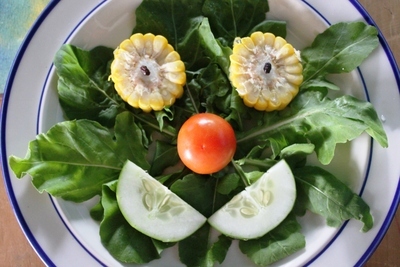 You could prepare one of these funny faces as a lunchtime joke, or get the kids to make their own using selected raw ingredients. Are they up for the challenge? This could also be a fun alternative birthday party activity when all they want to eat is lollies and junk. Try to make the food as colorful as possible. Funny Face 1 - Meet Mrs Pink. Can you guess what her face is made of? Any idea? The pink fruit with the tiny black seeds is actually Dragon fruit. Very mysterious and tropical, but in season for us right now. 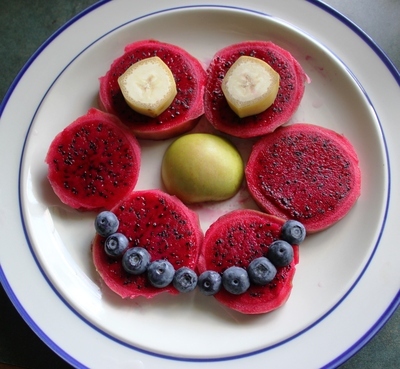 The eyes are sliced bananas, nose is a bit of green apple and the teeth are five fresh blueberries sliced in two. Yum. Funny Face 2 - This face has alfalfa hair with blueberry ribbons, grape teeth, banana and orange eyes and a red apple nose. This guy is a bit cheeky, I reckon. 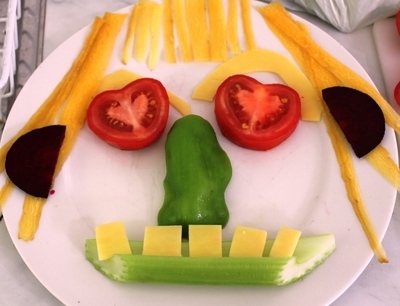 Funny Face 3 - This is a vegetable funny face with yellow carrot hair, cheese eyebrows and teeth, beetroot ears, celery mouth, tomato eyes and a nobbly capsicum nose. Funny Face 4 - Here's another crazy vegetable man, Monsieur Capsicum. 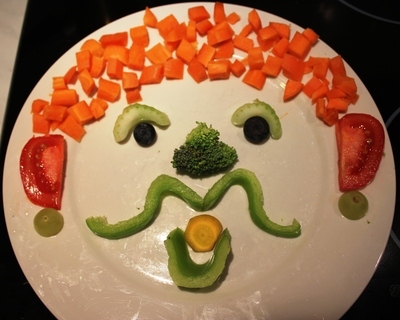 This one with chopped carrot hair, capsicum moustache and mouth, tomato ears, grape ear rings, blueberry and celery eyes and a cute broccoli nose. Funny Face 5 - We made a Rocket Man this time with rocket skin, tomato nose, cucumber mouth and currant eyes with "corn-rimmed glassed". What a great way to learn all about vegetables huh?